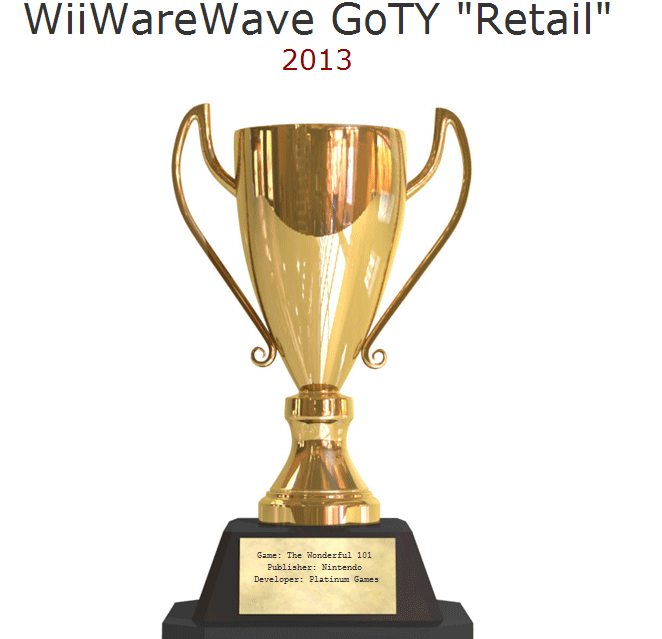 WiiWareWave's Second Annual GoTY Awards Retail Winner Announced. Congratulations to the winner of the first category! It is December so it's time for our Game of The Year Awards here at WiiWareWave and this year we have five separate categories for game developers and publishers to compete in. These categories are retail, digital, Wii U, 3DS, and indie and a game can only win in one category. This years' Retail GoTY Award goes to The Wonderful 101 a fantastic game that was published by Nintendo and developed by Platinum Games. Its quirkiness and fun gameplay made it the top choice in the retail category! Re: WiiWareWave's Second Annual GoTY Awards Retail Winner Announced. The Wonderful 101 most certainly deserves one of your GoTY awards! I doubt the developers or publishers are reading this, but I will say it anyways. Congratulations! The Wonderful 101 is awesome! @Clαππαd Thanks for getting the ball rolling on our GoTY Awards! Super Mario 3D World should be the Wii U GoTY! I think that Pokémon XY and Animal Crossing: New Leaf are both deserving of the 3DS GotY award. The Wonderful 101 deserves this award lol. The Wonderful 101 is far too underrated. It deserves this award.